The new Olympus OM-D E-M1 Mark II is being targeted to the professional who’s looking for a small, rugged body with great image quality. Behold Photokina, a sprawling, massive and exhausting collection of nearly every piece of photographic equipment on the market today. Held every other year in Cologne, Germany, Photokina is an incredible spectacle. First held in 1950, the show has since become the regular checkup for the photo industry, providing pundits and manufacturers alike a look at how the market is doing and what gear is to come. As it’s held biannually, it’s the one tradeshow for which most companies pull out all the stops. If someone’s missing from Photokina or their booth doesn’t seem packed with customers, it’s a dire warning. A crowded booth, on the other hand, signals who the key players are and often offers some surprises. The best thing about Photokina, though, is that it’s the target for most every company to have a fully fleshed-out product line for the years ahead. This year’s Photokina proved both interesting and a bit routine. Some companies had exciting new products to show, some seem poised to release new gear after the new year starts, and some simply displayed their existing product lines without any fanfare. We attended Photokina this year to take the pulse of the industry and report on its health. We’re happy to report that the health of the photographic market is good, though there were some notable issues to report. While it didn’t get nearly the press coverage as the 2011 earthquake that damaged the Fukushima Daiichi reactors and sparked a global concern about a meltdown, a series of earthquakes in April of 2016 referred to as the Kumamoto earthquakes (for the prefecture under which they occurred) threw the photographic manufacturers into a state of disarray. The shocks killed 49 and injured more than 3,000 people. The production lines of Sony, Nikon and others were halted as they were damaged by the quake, but the company suffering the most damage was Sony. The epicenter of the quake was just miles from the company’s chip plants, and the factory came to a standstill for more than a month. Not only did they suffer from a delay in output between the quake and the reopening of the factory, but all of the work being done in the plant at the time of the quake, which some estimate to have been a quarter-and-a-half-a-year’s worth of production, was destroyed. The reason that Sony’s plight is so notable, and the reason we’re mentioning it in a Photokina gear review, is that Sony is the industry’s most dominant sensor manufacturer. Many companies, from Canon to Hasselblad, have used imaging sensors manufactured by Sony. The result is that, for the first time, a number of companies announced their plans to bring things to market later in the year or in 2017, rather than releasing them immediately at or following Photokina. By far, the award for both “Most Interesting Launch” and “It’s About Time” goes to Fujifilm for the announcement of its new medium-format camera system, dubbed the GFX line. Even if you’re not a medium-format shooter, nor plan to be, this new system and the first model, the GFX 50S, is going to change the market. The new medium-format digital Fujifilm GFX 50S (front and rear) isn’t much larger than full-frame DSLRs and is compared here to the APS-C Fujifilm X-T2 (middle). Fujifilm already had a successful line of APS-C cameras with the X Series, the most recent of which are the X-Pro 2 and X-T2. In fact, Fujifilm was a pioneer of the “professional” mirrorless market, with the first interchangeable-lens APS-C system for pros. At the time the X-series was evolving, Sony released the a7 Series of full-frame cameras—one sensor size larger than APS-C. A larger sensor has a number of benefits over a smaller one, so Sony’s entry into the market posed a problem for Fuji. The company could keep producing APS-C-based cameras while Sony continued with its full-frame system, or it could jump into full-frame cameras and essentially compete directly with Sony. It turns out there was a third option, one that Fuji fans have been eagerly anticipating for years—jumping over a full-frame sensor and creating a medium-format camera with the new GFX line. This is not Fuji’s first medium-format camera. The company had some celebrated bodies in the film era, which it called the GX. That was part of what stoked the rumor mills—if Fuji made a medium-format camera once, maybe it would do it again. Even the name of the first camera in the GFX series harkens back to the film days. The GFX 50S will be the company’s first digital medium-format body, while the GX moniker was used on their well-regarded medium-format film systems. So why do you care that Fujifilm has announced a medium-format camera system, especially if the price tag (and stick with us after you hear this number) is going to be somewhere, according to Fujifilm, “considerably under” yet around $10,000”? First, it’s the first foray by a “traditional” digital mirrorless company into an important space. Medium-format sensors, being larger than full-frame sensors and much larger than APS-C sensors, have the potential to make a considerably better image than either of the traditional formats. With Fujifilm entering a new territory, you can be sure that some other manufacturers will follow. Will we see a Sony or Canon or Nikon medium-format in the future? Only time will tell, but Fujifilm won’t be the only company to enjoy this market space, any more than it remained the only company making APS-C mirrorless. Having a new system on the market at a price that might come in close to a Nikon D5 or Canon EOS-1D X Mark II puts tremendous pressure on these companies and all their rivals. If a studio photographer has the choice of, say, a $6,000 full-frame sensor or a Fujifilm GFX 50S with a 50 MP medium-format sensor for the same price, that’s going to be a very interesting decision. The next important development around the design of the GFX 50S is the size and weight of the system. At the show, we were given an exclusive press preview of the GFX 50S, and it was scantly bigger than many of the DSLRs the assembled journalists had with them. The GFX 50S could be mistaken for a Nikon D810 or a model in the Canon 5D series. Here, though, is where the issue of the Japanese earthquakes comes into play—neither the availability nor the price of the system were announced at Photokina. In previous years, a company announcing that a camera wouldn’t be available until the following quarter would be a bit odd, but soon (hopefully by the time you read this) we’ll know more about the GFX line. Right now, we know there will be three lenses available around launch and three more coming within a half year of the launch. In our limited time with the prototype GFX, it performed pretty admirably. While we didn’t have a variety of subjects and scenes to choose from, the camera operated faster than the current medium-format systems from Pentax, Hasselblad and Phase One, both in focus and in capture. It’s certainly not as fast as a traditional full-frame camera, but with the amount of data being captured, that’s not surprising. Since the Japanese earthquake, Sony has been mainly focused on releasing new lenses for its FE-mount mirrorless cameras. With the inability to crank out sensors, that makes sense—the optics are manufactured at a different facility. Photokina saw the company’s first major camera update since the earthquake, another long-rumored device, the Sony a99 II. This refresh of the Sony a99 serves two purposes—it signals to Sony DSLR customers that the company hasn’t abandoned that product line, and it allows the company to showcase its sensor and processor design. The Sony a99 II is one of the fastest DSLR-style cameras on the market, rivaling the Canon EOS-1D X Mark II and the Nikon D5, despite having a larger sensor, smaller body and a much smaller price. The Sony a99 II uses a Sony-designed and manufactured “backside illuminated” 42 MP sensor with a new system for reading the data from the sensor at lightning speeds. The processing is so fast that the a99 II captures 42 MP images at 12 fps. To put that into contrast, the Nikon D5 and Canon EOS-1D X Mark II capture (with focus) at 12 fps and 14 fps, respectively, but do so with a much smaller 20 MP sensor. The a99 II can capture uncompressed RAW, has a top ISO of 25,600 and can focus down to -4 EV (vs. -3 EV for the Nikon D5 and Canon EOS-1D X Mark II). The shutter is rated to a very professional 300,000 actuations. The body also features built-in five-axis stabilization and some of the very best 4K in its class. The Sony a99 II can grab full 4K with no pixel binning (a technique of reading only every few pixels to speed up processing the video data), clean HDMI output and professional S-Log and S-Log 2 formats. The Sony alpha cameras utilize an internal mirror that’s unique in the “SLR” market, in that it’s stationary and translucent. This allows the system to do some things that neither an SLR nor a mirrorless system can do. Light can pass through the mirror to the sensor and can also be directed to a dedicated AF module. Thanks to this, the camera has a dual-focus system comprised of 79 points on the AF model and 399 on the sensor, for an incredibly agile AF system. The a99 II can track subjects at all times thanks to this arrangement, while SLRs temporarily blank out the focusing when the mirror is up. After spending weeks testing this camera, it’s clear that this is one of the fastest-focusing and most accurate cameras on the market. All of these features are packed into a body that’s a fraction of the size of the top-end Nikon and Canon SLRs. It’s also a fraction of the price of the top-end Nikon and Canon. With a street price of $3,200, the a99 II is just under $3,000 less than the Canon EOS-1D X Mark II and more than $3,000 below a Nikon D5. This is a tremendous cost savings for the shooter looking to move into a professional body. It’s now possible, with the a99 II, to get a camera that performs on par with $6,000 top-end cameras for the price of a prosumer model. Another sensor format getting a nice refresh at the Photokina show is the now-mature Micro Four Thirds market. Both Olympus and Panasonic announced updates to their systems. Panasonic went first with what was a mix of a product announcement and a product road map. Its tangible new announcement was the GH5, another camera that’s been making the rounds of the rumor mills for some time, due again in part to the earthquake in Japan. Panasonic is the first major company to announce 6K video in a consumer device, arriving in the GH5. The company also announced it will release 8K cameras by the 2020 Olympic Games. Panasonic has been the more video-focused of the Micro Four Thirds partners, and the new GH5 is a compact video revolution. While the rest of the world is getting used to 4K video, the GH5 is going to be able to shoot in 6K. The company also announced a roadmap that will take it to 8K video by the time of the 2020 Olympic Games. A bit of a primer here: 4K video is at a max resolution of 4090×2160, and if you pulled individual frames from 4K video, you end up with an 8 MP equivalent image. With 8K video you can grab 33 MP files. So, while you end up with higher-resolution video, as a photographer, you can also shoot video and pull individual frames that are useable for client work. Panasonic didn’t reveal too many details of the new 6K system, so we’ll have to get the units in our hands to see how this performs. Like with the Fujifilm GFX and its medium-format sensor driving market innovation, Panasonic creating a 6K consumer-level camera will push other manufacturers to increase their video capabilities. 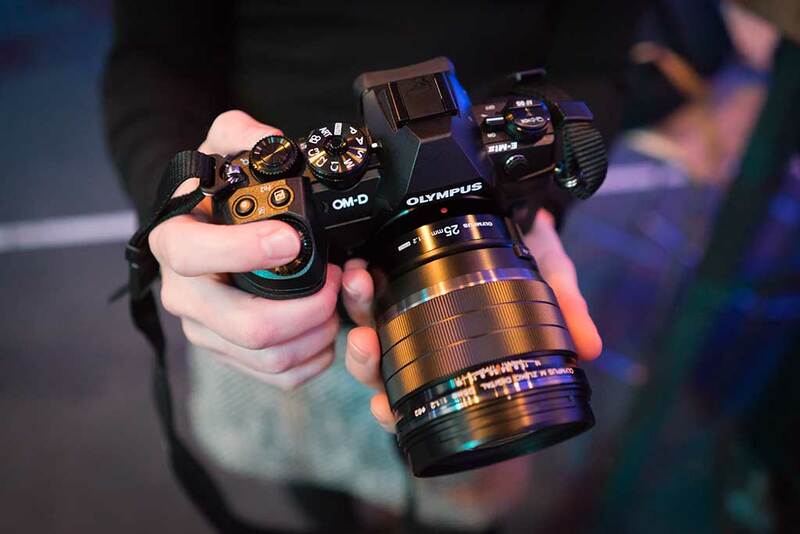 Olympus took a different approach to its updates, focusing on the photographic speed of its top-end OM-D E-M1 with a new OM-D E-M1 Mark II. The update to the company’s flagship mirrorless system is all about speed. The camera boasts faster focusing and faster processing. The OM-D E-M1 Mark II can capture raw images at 18 fps with full focus (the fastest in any mirrorless or still camera) and an unreal 60 fps in the single-focus S-AF mode. (This is another claim we’re looking forward to testing.) With 121 cross-type points, the OM-D E-M1 Mark II should be an incredibly adroit camera. Action camera and drone manufacturer YI Technology may be unknown in the photo space, but it’s trying to change that with a new Micro Four Thirds camera system, the YI M1. Inside the compact MFT is a 20 MP Sony sensor and a three-inch touch screen on the back. Yi is also releasing two lenses, a 12-40mm F3.5-5.6 and a 42.5mm F1.8, though you can use any MFT lens with this system. At $499 for the camera, which doesn’t provide as many controls as systems from Olympus and Panasonic, we’re not sure exactly who the camera is for, but having a new player in the Micro Four Thirds market is welcome, as it will help expand the popular system. Camera manufacturers were the primary stars of Photokina this year, and even those that didn’t announce new systems were showing recently announced products. Canon and Nikon showed their new cameras (with Canon spending a lot of time marketing the M5 mirrorless). Nikon’s booth was dominated by its “Key Mission” action cameras, as well. The show halls were also filled with accessories, light modifiers and all kinds of drones, the majority of which were already introduced earlier in the year. The few new gadgets announced at Photokina will be arriving on our shore between the PhotoPlus trade show in October and the first part of 2017. We’re looking forward to bringing reviews of them to you. No, it is NOT translucent. “Translucent” has a specific meaning, and wanting it to be different will not make it different. What you mean is that it is partly silvered. Some of the light is reflected, the remainder passes through.